January 16, 2019 -- When I started my implant clinic, I knew it would not be an easy task. However, the challenge of finding the right staff and establishing the proper systems was a challenge I was more than willing to take to pursue a discipline I was passionate about. Three years later, I can say I am proud of the success my clinic has found in creating our own implant center. However, that doesn't mean my team and I don't make mistakes. In fact, there are a few things I know now that I wish I knew when we were starting out. When we opened the center, we were sending patients out of the office for CT scans. We quickly recognized this was a barrier to treatment acceptance. Asking our patients to set an appointment with the imaging center was not the proper approach to getting busy people to invest in an expensive implant procedure. Investing in our own scanner removed a huge barrier for us. Our patients can now get their scan on the same day they speak to their dentist. This process makes it more convenient for the patient and allows the dentist to conduct better consultations. Making the implant process as seamless as possible is important if you are going to ask a patient to invest anywhere from $10,000 to $30,000 on implants. Purchasing a scanner may not be financially feasible for doctors who are just starting their clinic, but it is a goal you should strive and save for. Selling dental implants is not the same as selling a filling; they exist in two different markets with very different price points. Look at it this way: You wouldn't sell a million-dollar house to the same market of people looking for a $200,000 house. Finding the right team of people to create the value of your implant services is key. When we started our implant center, we did not think the sales conversation about implant procedures would be any different than the sales conversations with patients about any other procedure. This was a mistake. Selling a large implant case requires training and experience. Good financial coordinators will feel comfortable quoting $20,000 or more for implant work because they understand the value for patients who have dealt with bad teeth their whole life. It may be very difficult to find financial coordinators who can help a patient jump the financial hurdles of implants and go ahead with a much-needed procedure, but don't just assume your team members can sell implants because they worked in the dental industry. Find and train people who know or want to know implants. Remember that it is very unlikely that any of us would start something new and have it become an instant success. Bumps in the road are a natural part of the process and a frequent occurrence when rolling out an implant center. Doing the market research will better prepare you for challenges along the way. One of the benefits of doing this research is that it forces you to create a business plan. A plan will set you up better for success than just hoping it works out. Market research requires you to do your homework on the vendors and supply companies you want to work with. It means having a clearly defined marketing budget and following through with your marketing plan to get new customers. Give your implant center its own marketing and infrastructure separate from your practice and treat each patient one at a time, letting your work serve as another way to market your skills. I also tell fellow practitioners not to sleep on marketing. I recommend having a six-month marketing budget ready. Marketing isn't just something that happens outside of your practice to bring people in. You need a marketing process for when patients come in as well. I wish I had invested in an internal marketing plan much sooner because when I did, it started to pay off tremendously. 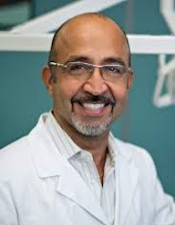 Dr. Edward Harsini is the owner of Smile Dental Clinics in Phoenix.